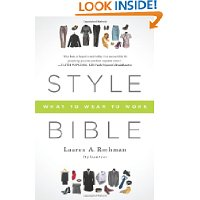 “Style Bible- What to Wear to Work” – is now available after almost two years of commitment by Lauren Rothman-Styleauteur, to write a practical and realistic fashion guide for woman, men, graduates, professionals and the average person. “Style Bible- What to Wear to Work” – is now available after almost two years of commitment by Lauren, to write a practical and realistic fashion guide for woman, men, graduates, professionals and the average person. This is the “perfect” fashion guide, as first impressions (and second ones!) count, whether you are an intern or a CEO. Lauren A. Rothman addresses an age-old dilemma: how to be appropriate and stylish in the workplace. Based on a decade of experience in the fashion industry, she addresses the basics of fashion and executive presence by offering advice, anecdotes, and style alerts that help readers avoid major fashion faux pas at the office. Style Bible: What to Wear to Work is the must-have resource for the modern professional, male or female, climbing the ladder of success. Lauren identifies the ultimate wardrobe essentials, and reveals shopping strategies and destinations for the everyday person. Style Bible, complete with helpful illustrations,is the go-to manual on how to dress for every professional occasion and a valuable resource for understanding dress codes by industry, city, and gender so that your visual cues will make a strong impact. Make a commitment to being better dressed at work with Style Bible. Please visit Styleauteur’s website, Facebook page and Amazon.com, where you can buy the book. It would be great if you would “like: Lauren on Facebook and if so inclined after you “buy” the book, write a review on Amazon. Thanks for taking the time to review- and by the way – “buy the book”, its good. Lauren A. Rothman, also known as the Styleauteur, is a fashion, style, and trend expert. Lauren has her finger on the pulse of fashion—from shopping closets across the country to discussing executive presence, political style, and First Family fashions on Entertainment Tonight, CNN, E! News, The Insider, AP News, Reuters, and ABC News. She is greatly sought after as a stylist, and her tips on wardrobe management and creating a versatile, fashion-forward closet have been featured in Glamour, Real Simple, People StyleWatch, The Washington Post, The New York Post, Politico, as well as on NPR, and XM/Sirius radio. Lauren writes a column, Fashion Whip, for The Huffington Post, on style and politics, and maintains an image therapy practice working with individual and corporate clients to help increase their style quotient. She got her start as an intern at Elle Magazine and her wide-ranging experience includes positions as a cool hunter at Faith Popcorn’s BrainReserve, and a personal shopper at Nordstrom and Saks Fifth Avenue.